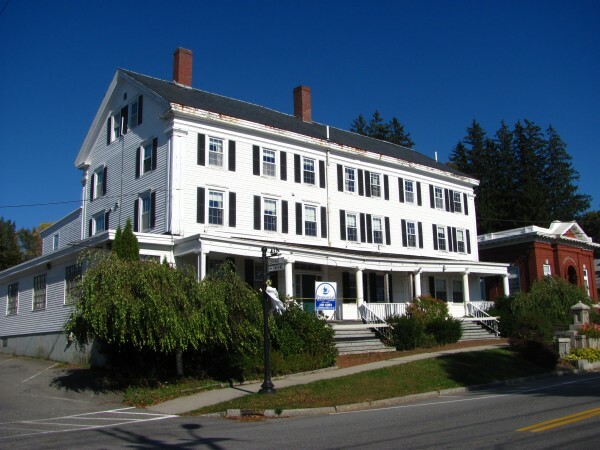 The current owner of the former Jed Prouty Inn, located on Main Street in Bucksport, will attempt to sell the historic building during an online auction from Tuesday, Oct. 11, 2011, to Thursday, Oct. 13, 2011. Built around 1780, the 17-bedroom inn has hosted presidents and other famous figures. But it has sat vacant for nearly eight years and is in need of significant renovations and repairs. BUCKSPORT, Maine — A 230-year-old Bucksport landmark that has hosted presidents, arctic explorers and other famous figures but has sat lifeless for the better part of a decade is about to go on the auction block. The Jed Prouty Inn, as the building is still known, is a 17-bedroom former hotel that has anchored Bucksport’s Main Street in one form or another since about 1780. Now the financial firm that acquired the building after the last business closed nearly eight years ago is hoping a buyer will emerge during an online auction held Tuesday through Thursday. Bidding will start at $30,000 for the property. But no matter how much the Jed Prouty sells for — if it sells at all, that is — any potential buyer should be prepared to pay out significant sums to get the old inn back to usable shape. Originally built as a two-family home, the building was converted to an inn sometime around 1820. Over the years, the inn’s clients included several presidents — Martin Van Buren, James Buchanan, John Tyler, William Henry Harrison — as well as statesman Daniel Webster. Admiral Robert Peary, who is credited with leading the first expedition to the North Pole, reportedly stayed at the inn for months while his expedition’s ship was under construction in Bucksport. But the building has sat vacant for much of the past quarter-century. Town officials have watched with growing concern as the building continued to deteriorate after an assisted living business moved out in March 2004. The building is now owned by an affiliate of the Lehman Bros. financial firm. The building underwent extensive renovations in the late 1990s to install sprinkler systems, an elevator and other features to bring the structure up to code for the assisted living facility. The building also has a full commercial kitchen — complete with equipment — as well as a tavern. However, a recent architectural survey commissioned by the town estimated it would cost more than $250,000 to repair the former inn. For instance, the large front porch on the three-story building will have to be replaced, as will a retaining wall at the rear of the building. “It would be a shame to see it rot away any more than it has,” said David Keene, Bucksport mayor and Town Council chairman. Baron-Murphy, who works for Prudential Northeast Properties, said she fielded a few calls on the property on Monday. Past offers have ranged from $75,000 to $550,000, but none of those deals was ever completed. The most recent asking price was just under $300,000. One couple that will be watching the auction closely is John and Rhonda Chambers. The Chambers, who live in Calais, already operate five senior housing facilities in Maine and have been in discussions with Bucksport officials about expanding to the town, possibly to the Jed Prouty building. The Bucksport Town Council held a public hearing in late September to gauge residents’ feelings about whether the town should offer the Chambers $150,000 to $200,000 in financial assistance to renovate the Jed Prouty. Keene said Monday that the town’s money would have to be used for specific, pre-approved improvements to bring the building up to code. Keene said the assistance likely would be a type of loan that gradually would be forgiven as long as the assisted living facility remained in business. But before town officials would offer the Chambers or any other buyer money to save the Jed Prouty, they would have to be convinced that the new owners have a viable business plan, he said. Keene said there appears to be a lot of support among residents for using town money to help pay for renovations in order to save the historic building. “But then again, we are looking for some sort of business plan … to prove it is going to be a viable business before the town commits any money,” he said. John Chambers said Monday that the couple does not plan to participate in the online auction but will monitor it before deciding whether to put in their own offer on the building. But even if the Jed Prouty building is sold to someone else, Chambers said he and his wife still are interested in establishing an assisted living facility in Bucksport to meet the needs of the area. “We are still going to work with the town to find an alternative,” Chambers said. For information about the auction, visit http://bdn.to/proutyauction.